1From the Start screen, open the Mail app's tile and click the New icon in the program's top-right corner. A New Message window appears, empty and awaiting your words. If you’ve added more than one e-mail account to the Mail app, choose your return address by clicking the downward-pointing arrow in the From box — the box currently listing your e-mail address. 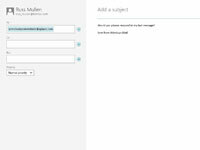 Then select the account you want to use for sending that particular mail. 2Type your friend's e-mail address into the To box. As you begin typing, the Mail app scans your People app’s list for both names and e-mail addresses, listing potential matches below the To box. Spot a match on the list? Click it, and the Mail app automatically fills in the rest of the e-mail address. 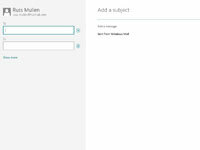 To send an e-mail to several people, click the plus sign to the right of the To box. The People app appears, listing your contacts’ names and e-mail addresses. Click the name — or names — of the people you want to receive your e-mail and then click the Add button. The Mail app addresses your e-mail, just as if you’d typed it in manually. 3Click in the Subject line and type in a subject. Click the words Add a Subject at the top of the message and type in your own subject. For example, here the subject is Memorandum for Success. Although optional, the Subject line helps your friends sort their mail. 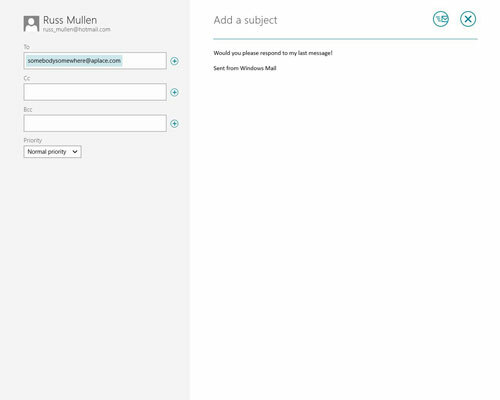 4Type your message into the large box beneath the Subject line. Type as many words as you want. As you type, the Mail app underlines potentially misspelled words in red. To correct them, right-click the underlined word and choose the correct spelling from the pop-up menu. You can also change formatting by fetching the App bar along the app’s bottom edge by right-clicking, by pressing Windows+Z, or by swiping upward on a tablet. 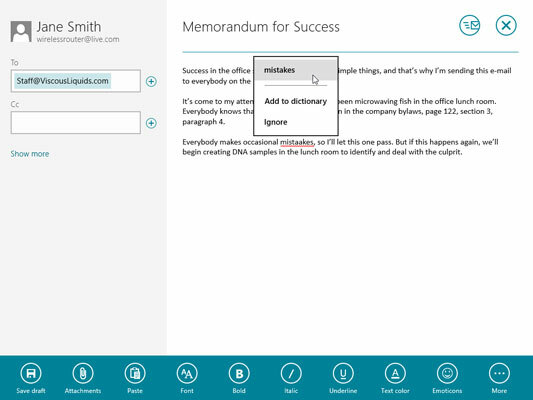 The App bar along the bottom lets you add bulleted lists, change fonts, add italics, and more. 5If you want, attach any files or photos to your e-mail. 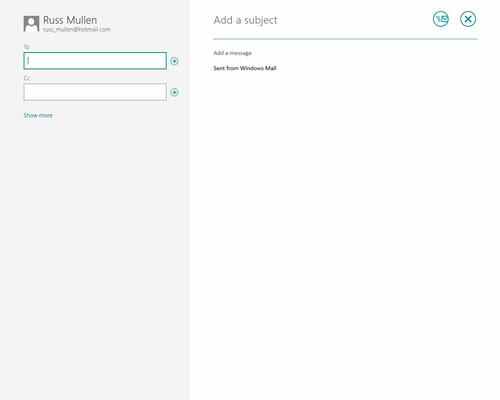 If you’re feeling savvy, you can attach them by clicking the Attachments icon on the Mail app’s App bar. Most ISPs balk at sending files larger than about 5MB, which rules out nearly all movies and more than a few files containing digital music or photos. 6Click the Send button along the top-right corner. Whoosh! The Mail app whisks your message through the Internet to your friend’s mailbox. Depending on the speed of your Internet connection, mail can arrive anywhere from 5 seconds later to a few days later, with a few minutes being the average. Don‘t want to send the message? Then click the Close button, shown in the margin. When a drop-down menu appears, choose Delete to delete the message or choose Save Draft to keep a copy in your Drafts folder for later polishing.